Unraveled: Tale of the Shipbreaker's Daughter is now online! Part of the 『Garden of Dreams』 franchise, with Sweet Lily Dreams and Whisper of a Rose. Please support the project or simply pre-order the game for $10 on Kickstarter! There are lots of extra exclusive goodies you will get! Immerse yourself in a moving musical score hand-crafted by Japanese RPG veteran composers Hiroki Kikuta and Dale North. Every scene and every emotion is shown purely through our beautiful hand-crafted sprites. Engage in slick, strategic combat with your monstrously fluffy companion. Relive your childhood fantasies as you travel through a little girl's imagination, full of giant sand castles, dragons, magical items, classic puzzles and an 80's themed doll house. Discover a bit about our world as the story of Unraveled is based on real events at a ship breaking yard -- inspired by the documentary The Wire Nest! As said before, the music is made by legendary Hiroki Kikuta. He has composed for videogames Secret of Mana, Soul Calibur V and Shining Hearts. He sees great potential in Unraveled and is happy to work with us! So please support our project! We have already been funded for over 25%! That's over 170 pre-order! Thank you so much!! But we need more to reach that 100%, so please support our project! Furthermore, I would like to ask everyone reading this to Thunderclap[www.thunderclap.it] us on social media! It would be VERY helpful, even if you can't pre-order or support the project on Kickstarter. It only takes a second, so if you have Facebook, Twitter or Tumblr, please do. Kickstarter Relaunched!! Funded 10% in 1 day! Click to go to Unraveled's relaunch! Hey everyone! Unraveled has launched its new Kickstarter campaign. Please go over there and pledge your support (or support us again if you backed our previous campaign)! Thank you all very very much for your support! We could not have gotten here without all of you! New Demo is live! 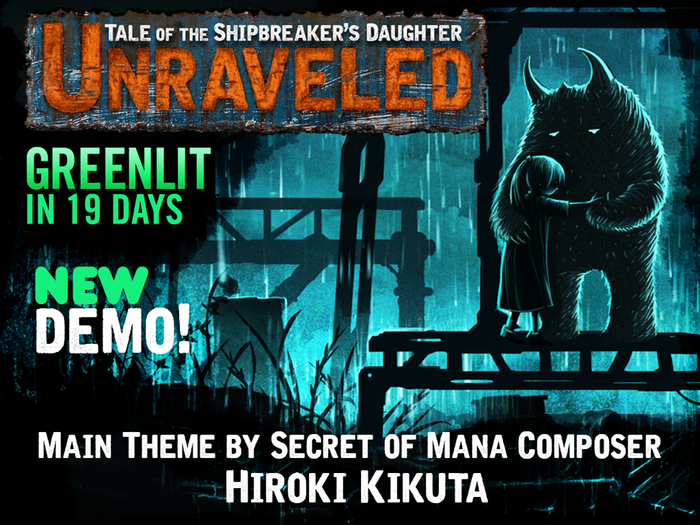 Check it out to hear Secret of Mana composer Hiroki Kikuta's theme for Unraveled! The teased new artwork has been reveled! We've got a small amount of Early Bird specials! Tell Grandma! Please check out all the great new rewards! We have streamlined based off of your helpful feedback! No more Stretch Goals. We want to purely focus on Unraveled completion! Click here and join us on our journey! Launched May 2, 2015! An adventure, an RPG, a platformer, an interactive story -- the story of a little girl whose family has gone missing at a ship breaking yard. Based on real events, Unraveled takes you through a child's imagination as she seeks out her parents. Relive your childhood fantasies on a journey that will make you think, laugh and tear up (just a little bit). *Note: Vietnamese is included as a language. Why are you on Greenlight? We are RosePortal Games -- a tiny group of individuals who has been releasing indie games since 2008. We currently already have two games on Steam (Whisper of a Rose and Sweet Lily Dreams) but are aiming for complete freedom in work and publication with Unraveled. If you vote for us, you're voting for our artistic freedom and an unforgettable gaming experience for you. Because we already have two full published games on Steam, we have credibility to back us up. If we get Greenlit, you can be sure that we'll deliver an amazing game to Steam! Tell me some more about Unraveled. Okay, I love your enthusiasm! Unraveled is a dialogue-free game (save for one or two sentences) that is purely "show, don't tell". We're telling the story of a little girl's life by showing the way it affects her imagination. As you travel through the ship breaking yard the ghastly rotten environment transforms into various fantastical settings. Accompanied by flashbacks and exciting events, Unraveled subtly gives you all the pieces of a story. There are also plenty of fearsome foes to fight off in thrilling battles, puzzles to solve, items to collect, and there's even an 80s doll house that you can decorate for bonuses! The battle system features a completely unique "State Balance" system that is strategic, simple and fun at the same time! That is correct! Ship breaking yards and those who live around them are hardly ever covered by media and news. These families have to cope with horrible living conditions while facing the daily threat of their extinction. Though indeed supplying the civilians with work, the safety regulations are next to nonexistent and the pay is incredibly low. We wanted to cover this obscure aspect of our world and came up with the game that is Unraveled! A completely unique battle system based around each character's "State Balance". Tomb Raider inspired platforming to make exploration fun and exciting. An 80s doll house that you can decorate for bonus effects! A beautiful story conveyed purely through "show, don't tell". Fantastical environments and enemies that will make you miss the days you fought against a dragon by throwing LEGO at it! Gorgeous art scattered throughout the game. Complimentary Steam Achievements and Trading Cards. Aaron van der Brugge (that's me!) is the main artist for Unraveled. I've released 4 indie games in the past 5 years and have been making (video / board) games since I was a child. I'm so passionate about game production because I want to convey certain messages and thoughts about the world, and it is the perfect media platform for that. I also love the visual aspect of video games. The atmosphere, the feelings. If I can touch just one person with my game, I'll be a happy developer! OT: I love cats, Stevie Nicks and traveling. Chancler Harrison is the co-producer of Unraveled. Learning about the world is very important to me. I believe growing from the life stories people have shared with me fuel my imagination. My husband is my greatest hero and supporter even if he doesn't understand my ideas (he's good at nodding!). I fear spiders and auto-tune makes me feel very uncomfortable. Dinosaurs and sloths are awesome. Great news! I love the intro. I know that sounds arbitrary, but there's only a couple of major things left to finish for it! Their Facebook was updated yesterday. Would never abandon a project, let alone one that was Greenlit AND Kickstarted! #1 priority project!